Astralis Bion, Virtual hybrid synth from Homegrown Sounds. 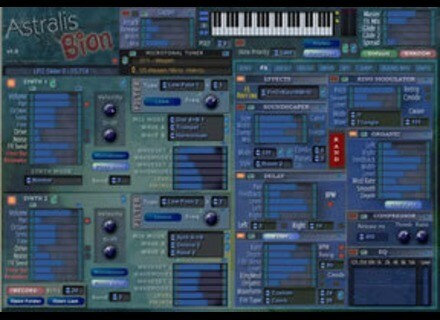 Homegrown Sounds has announced the release of its new Astralis Bion synthesizer VST instrument plug-in for Windows and announced the Astralis Synth Collection Group Buy. Astralis Bion is described as "the most powerful synth in the Astralis range." It has a custom built oscillator with 3500+ possible waveforms and filter types including Low Passes, Hi Passes, Band Shelf and Comb. The Astralis range of synths are primarily designed for easily creating atmospheric and ambient landscapes, though Bion is useful for any style of music due to the huge array of features, the company says. Astralis Bion consists of two identical synths each with its own envelopes and filter, etc. Features include an effects section, Microtuner, Programmable Arpeggiator, Gapper, two Modulation Sequencers, Gate Sequencer, LFO and a flexible Modulation Matrix. Each synth has a dual oscillator so that 2 waveforms can be selected and then one of 21 different modes can be used to decide how they interact. Modes include Add, Subtract, Split and FM. As for the wave shapes, there are several of presets such as Sine, Triangle, Saw, Square, etc. as well as the Wavesets, which are a collection of pre-defined shapes selectable from the Waveset slider. The random button can be used to quickly pass through sounds until a suitable one is found. The FX Section includes Stereo Delay, Flanger/Filter, Ring Modulator, SoundScaper and Organic, as well as a compressor. There are 127 possible routing combinations. SoundScaper is a delay based effect which is capable of effects such as combs, Reverbs, Echoes and complex undulating delay beds. There is also a Recorder built in which automatically captures the Synth output to WAV at either 16, 24 or 32 bit. The Microtuner can load Scala files and the synth comes with 300 Patches included, which are shared across all of the Astralis Synths. 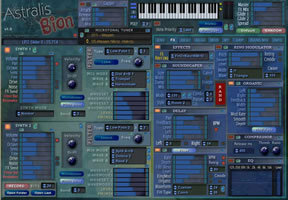 Priced at £30, Astralis Bion is available for Windows as a VST instrument plug-in. It can also be purchased as part of the Astralis Collection which includes Orgone, Astralis A, Astralis B, Bionic and Astralis FX. A Scala file creator is also under development and will be available soon as part of the pack. Homegrown Sounds is also currently running a Group Buy for the full Astralis Synth Collection, which includes Bion. The Group Buy will run until October 4th, 2009. The lowest price possible, if at least 50 people sign up, is £40. Alterex Updates ViCON Alterex has updated the modified version of ViCON. Expert Sleepers Updates Silent Way Expert Sleepers has updated Silent Way to v1.3.0, adding a polyphonic mode for the Voice Controller plug-in. Rogue Amoeba Updates NiceCast Rogue Amoeba has updated Nicecast to v1.9.8, which brings with it Mac OS X 10.6 (Snow Leopard) compatibility.